Is that you can join in whether you have a voice or not. All Christians are commanded to sing whether we have a great voice or not. Everyone can “sing and make melody in your heart to the Lord” (Ephesians 5:19). This is good and acceptable and pleasing in God’s sight. Now this is the main point of the things we are saying: We have such a High Priest, who is seated at the right hand of the throne of the Majesty in the heavens, a Minister of the sanctuary and of the true tabernacle which the Lord erected, and not man. For every high priest is appointed to offer both gifts and sacrifices. Therefore it is necessary that this One also have something to offer. For if He were on earth, He would not be a priest, since there are priests who offer the gifts according to the law; who serve the copy and shadow of the heavenly things, as Moses was divinely instructed when he was about to make the tabernacle. For He said, “See that you make all things according to the pattern shown you on the mountain.” But now He has obtained a more excellent ministry, inasmuch as He is also Mediator of a better covenant, which was established on better promises. In that He says, “A new covenant,” He has made the first obsolete. Now what is becoming obsolete and growing old is ready to vanish away. From our text we notice that God told Moses, “See that you make everything according to the pattern shown you on the mountain” (Hebrews 8:5). If it was necessary for Moses to follow the pattern in building the tabernacle, it is even more necessary for us to do all things according to the pattern in the church, of which the tabernacle was only a type. The church is, “the true tabernacle which the Lord pitched and not man.” And Jesus Christ is the Minister of the true tabernacle—the church (Hebrews 8:2). Let us read each of these scriptures listed on this chart followed by a few brief comments. “Praise the Lord, all you Gentiles! In these five verses it is stated twice that Christ and the Gentiles would praise God by singing hymns and praises to the Lord. This is an obvious reference to the worship of the New Testament church which was made up of Jews and Gentiles. Notice that singing is specified. The Jews and the Gentiles were to accept one another in order to bring praise to God. God and Christ sanctify or set us apart for a special purpose. The writer says that the one doing the setting apart and those who are set apart are all of one. Therefore, Christ calls his people “brethren.” Christ dwells in his people and therefore “in the midst of the assembly” he sings praise to God. “The assembly” (ekklesias) is the church! Christ is in our assembly today: “For where two or three are gathered together in my name, there am I in the midst of them” (Matthew 18:20). Christ was singing praise to God with us today. Notice the kind of music is specifically to sing. Let the word of Christ dwell in you richly as you teach and admonish one another with all wisdom, and as you sing psalms, hymns and spiritual songs with gratitude in your hearts to God. And whatever you do, whether in word or deed, do it all in the name of the Lord Jesus, giving thanks to God the Father through him. Notice that according to these verses we must have authority for everything we do in word or deed. To do something “in the name of the Lord Jesus,” is to do that thing by his authority. Therefore, what we do in worship to God must be authorized by God’s will. And what are we commanded to do? We are to “sing psalms, hymns and spiritual songs.” Let us also read the scripture in Ephesians that is parallel with what we have just read from the book of Colossians. Therefore do not be unwise, but understand what the will of the Lord is. And do not be drunk with wine, in which is dissipation; but be filled with the Spirit, speaking to one another in psalms and hymns and spiritual songs, singing and making melody in your heart to the Lord, giving thanks always for all things to God the Father in the name of our Lord Jesus Christ, submitting to one another in the fear of God. In these two scriptures we are not only specifically commanded to sing, but we also are specifically commanded in the kind of music we are to sing. We are to sing “psalms, hymns and spiritual songs.” Every kind of song not included in these three classes has been excluded. In other words we are to sing spiritual lyrics and not secular lyrics. Concerning the spiritual songs, God did not give us a certain melody, he did not say sing it fast or slow, he did not say that we should sing songs written 100 years ago or songs written today. He left that up to man as long as we are obeying the command “to sing and make melody in our heart to the Lord.” We do not have any patience with these “church clowns” who can sing “Bringing in the Sheaves” with a sanctimonious face like they’re going to a funeral, but will make a fuss over singing a joyful song of praise to the Lord. We must be as specific as the scriptures, but not less or more specific. To do so is either to take away or add to God’s word, and we remember the warning about doing that (1 Corinthians 4:6; Revelation 22:19). From the reading of these four scriptures we have noticed that singing is specified in our worship to God. But where are the scriptures for the use of instrumental music in worship? They are not to be found in the New Testament. We’re not under the Law of Moses. We are amenable to the law of Christ. We cannot go back to the old law and try to find authority for instrumental music in worship to God. We are to worship God in the church—the true tabernacle which the Lord pitched, and not the tabernacle that Moses pitched in the wilderness. 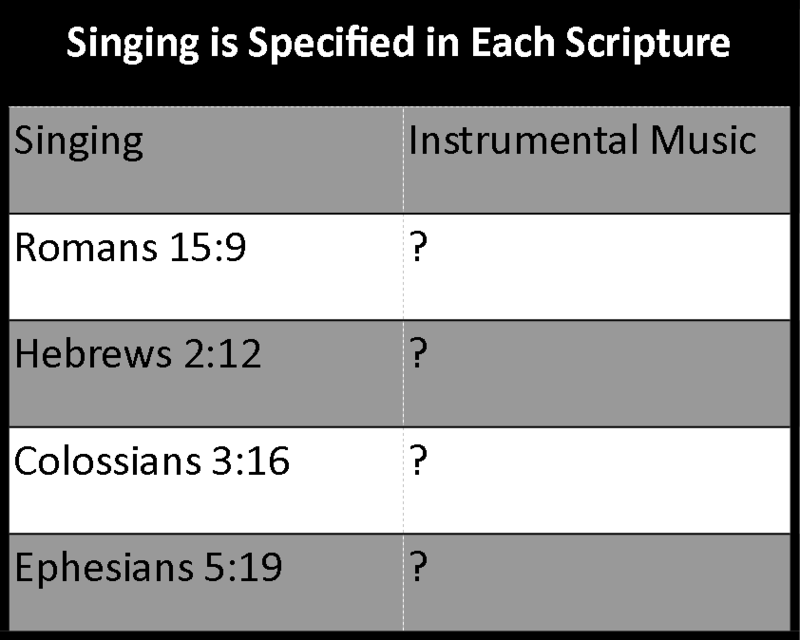 Where is the scripture in the New Testament authorizing the use of instrumental music in worship to God? I used to say that instrumental music is not mentioned in the New Testament. I do not say that anymore, because it is mentioned in the New Testament. But where it is mentioned it is always in regards to something other than worship. It is used as an illustration of the certain sound of a trumpet calling the army to battle (1 Corinthians 14:7-8). All mention of instrumental music in the New Testament is in reference to something other than worship. All reference to the music of the church in regards to worship specifically commands us to sing. But there are no commandments for instrumental music in worship to God. This is a law that we use in our everyday activities. For example if some of you men went to a dealership and said, “I am interested in buying a truck.” The salesman could show you any and all trucks on the lot. But if you specified that you were interested in a red Dodge, half ton pickup, with an extended cab and a V-8 engine, then that would exclude all trucks not within that specific description. This same principle has been used in the Bible down through the centuries. God told Noah to build an ark out of gopher wood. When God specified gopher wood, then that excluded any and all other coordinate species of wood. There were many different coordinate species of wood—pine, oak, cypress and cedar. Out of these God selected one kind—gopher wood. In order for Noah to obey God he had to use the wood selected by God. Our second example involves the commemorative institution of the Passover. This was designed to remind future generations of the bitterness of slavery and their mighty deliverance by the hand of God. In this act of worship they were commanded to offer up a sacrifice to God. Out of all the coordinate species of animals God selected one kind—a lamb without spot and blemish. This command excluded all other species of animals. Israel’s worship would only be accepted when they offered up the sacrifice selected by God. This lamb was a type of our Paschal lamb—Jesus Christ the Lamb of God offered up for the sins of the world. Our third example pertains to the worship in the assembly of the church. We shall notice the kind of music that is to be offered up to God in praise. There are only three kinds of music: vocal, instrumental and a combination of both. Out of these coordinate species of music God named one kind—singing. The church can only obey God by using the kind of music he specified. When God selected singing, then that command excluded all other kinds of music. These three examples are all parallel. When man serves God it must be in the realm of faith. “We walk by faith and not by sight.” This means that we act according to the way that God speaks. Faith comes by hearing God’s word (Romans 10:17). When we act by faith there must be God’s word to back it up. 1. We are commanded to assemble every first day of the week. We are commanded to assemble by being commanded not to forsake the assembly (Hebrews 10:25). 2. We are authorized to worship God on Sunday, the Lord’s Day. The church at Ephesus assembled to worship on the first day of the week (Acts 20:7). The Lord’s Day is in the realm of faith. 3. Observing the Lord’s death by eating the Lord’s Supper each first day of the week is a command of God. It is in the realm of faith because the church at Corinth was commanded to observe the Lord’s Supper with the right spirit when they came together on the first day of each week (1 Corinthians 11:22-33). 4. To engage in preaching the gospel, teaching the apostles doctrine and lifting up prayers are all in the realm of faith, because God’s word backs up these actions (Acts 20:7; Acts 2:42). 5. The New Testament church took up a weekly contribution to support all the work that God gave the church to do. This action is in the realm of faith because it is a command of God (1 Corinthians 16:1-2). 6. And in the same manner the command to sing psalms, hymns and spiritual songs is a direct command of God. 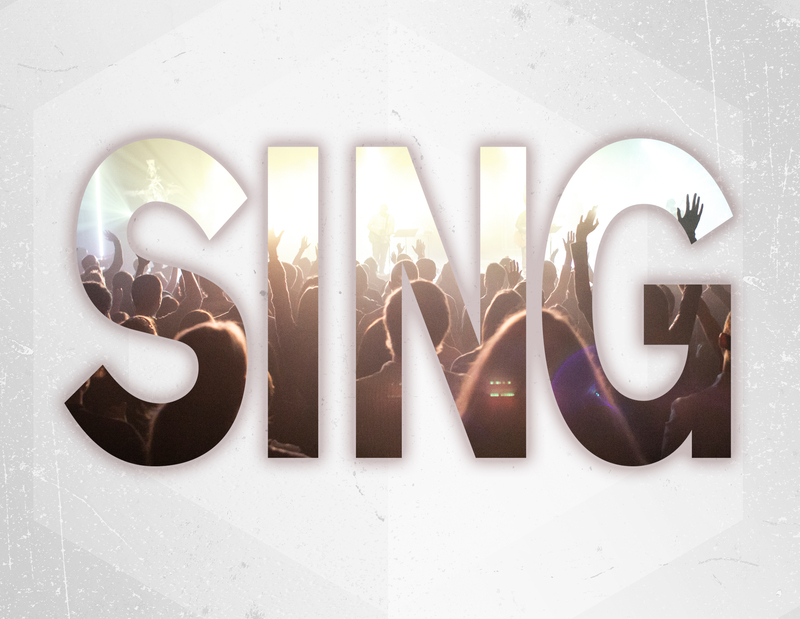 Singing is in the realm of faith (Hebrews 2:11-12; Ephesians 5:19). 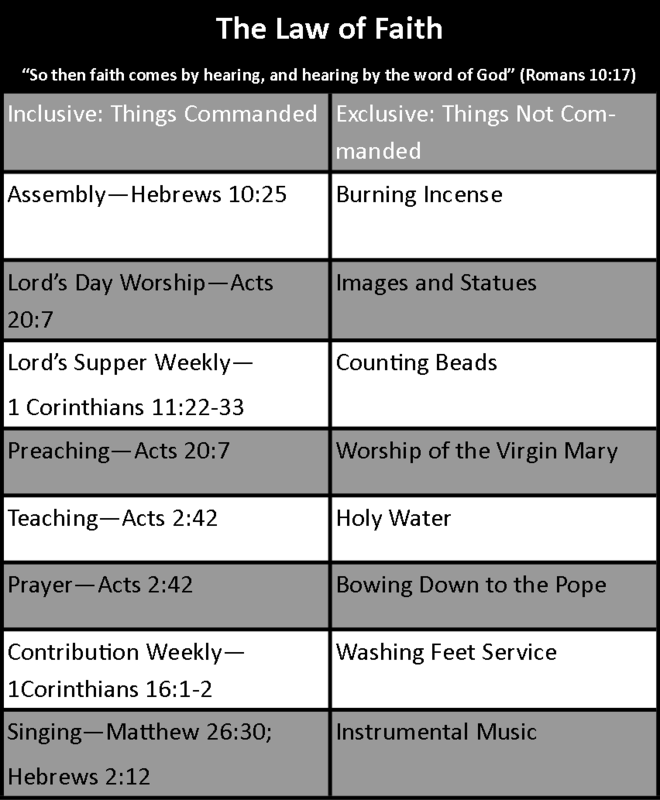 On the right side of the chart we notice several things that have been introduced in worship by some religious groups. But not one of these is in the realm of faith. Therefore, burning incense, the adoration of images and statues, the counting of beads, the worship of the Virgin Mary, the use of so-called holy water, the kissing of the Pope’s toe and the washing of feet are things that are not commanded and therefore are excluded from the realm of faith. And in the same way instrumental music in worship to God is also excluded, because there is not one passage of Scripture authorizing its use in New Testament worship. Finally we shall test the argument that is sometimes made that instrumental music is acceptable today because it WAS acceptable under the law Moses. But now He has obtained a more excellent ministry, inasmuch as He is also Mediator of a better covenant, which was established on better promises. When we have something that is old and not useful anymore, we do away with it and get something new that is useful. When the old law had served its purpose it was removed, and the new law was inaugurated in its place. The old law was nailed to the cross of Christ (Colossians 2:14). Therefore the cross stands as the dividing line between the old law and the new law. The cross is the dividing line between the old law and the new law (Ephesians 2:14). 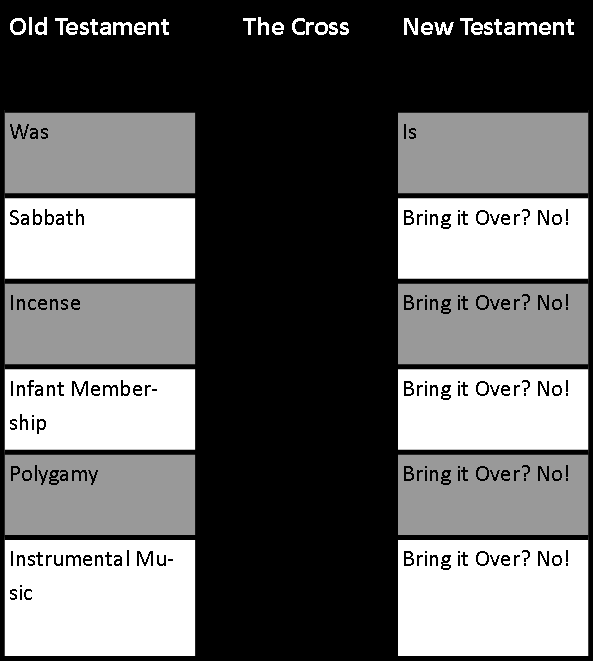 Notice on the chart that if we can bring instrumental music over to our worship because it was used in the Old Testament, then likewise we can bring over the seventh day or Sabbath worship, infant membership and polygamy. But we should not bring any of these over. We should be content with the acts of worship given to us by Christ and the apostles. And in the area of music the specific act of singing is commanded. It is something that everyone can do. It is something done physically, mentally, spiritually and emotionally. *Shelby G. Floyd delivered this sermon May 5, 2002 at the Heartland Church of Christ, Greenwood, Indiana. 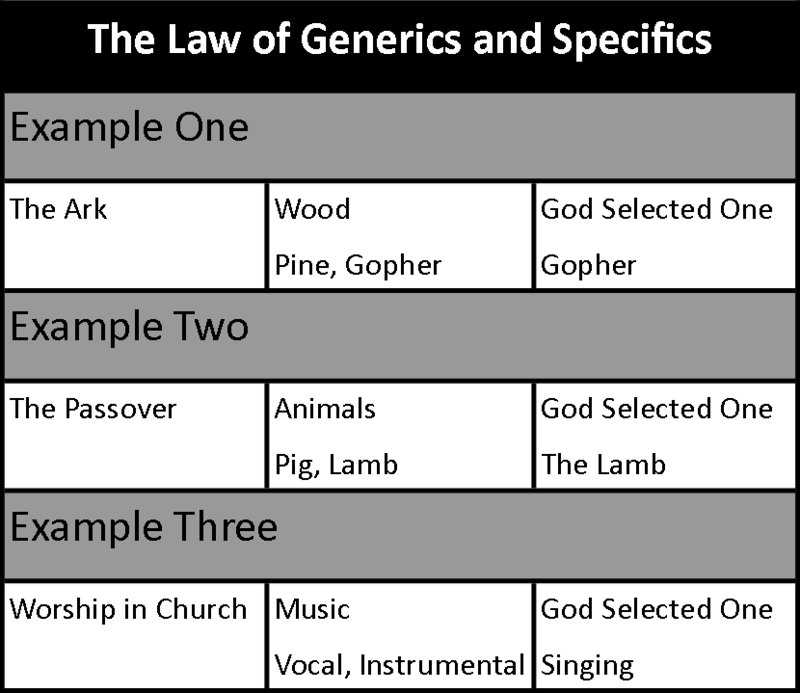 The foregoing charts are adapted from Instrumental Music In The Worship, M. C. Kurfees, Scope of the Divine Command Authorizing Music in the Worship of God, pp. 72, 74, 77; and Bulwarks Of The Faith, Foy E. Wallace Jr., Innovations In The Church—Instrumental Music, pp. 226-294.